REMINDER TO KEEP TRACK OF ALL YOUR VOLUNTEER HOURS AND HAND THEM IN TO OUR PRESIDENT JUDY JEFFERY EACH MONTH. INTERESTED IN BIRDS? SATURDAY, MARCH 20TH AT 2:00 P.M. JIM SMITH OF HALDIMAND BIRD OBSERVATORY, LONG POINT BIRD BANDING STATION, PRESENTATION. CALL FOR INFO AT 905-774-5308 DUNNVILLE LIBRARY. HOUSEPLANTS ARE AN AMAZING AIR PURIFIER. YOUR BEST BETS ARE SPIDER PLANTS, PEACE LILIES, BOSTON FERNS, PHILODENDRONS, ETC. CANADA BLOOMS HAS CHANGED TO A NEW LOCATION AT THE DIRECT ENERGY CENTRE, EXIBITION PLACE, TORONTO. SHOW IS MARCH 17TH TO 20TH FROM 10:00A.M. TO 8:00 P.M. AND MARCH 21ST FROM 10:00A.M. TO 6:00 P.M. ADMISSION IS $8.00. 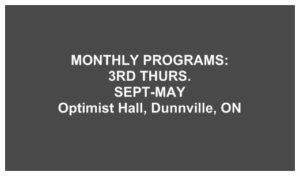 TOP NOTCH SPEAKERS ARE JACK KENT OF THE POTTING SHED IN DUNNVILLE AND BELINDA GALLAGHER OF THE ROYAL BOTANICAL GARDENS, DEMONSTRATIONS, ETC. CELTIC SPRING IS HELD MARCH 19TH TO 28TH. MONDAY TO FRIDAY, 9:00 A.M. TO 3:00 P.M. AND SATURDAYS & SUNDAY FROM 9:00 A.M. TO 4:00 P.M. AT THE TROPICAL HOUSE, GAGE PARK, HAMILTON WITH FREE ADMISSION. NEATLY BRIDGING THE END OF WINTER AND THE BEGINNING OF SPRING, THIS SHOW IS LARGE IN SPIRIT AND AMBITION IF NOT SIZE. AND WILL TAKE ABOUT AN HOUR. NIAGARA COLLEGE WILL BE HAVING A TWO DAY EVENT ”IN YOUR BACKYARD” VENDOR MARKETPLACE/ HORTICULTURAL TRADESHOW MARCH 20TH AND 21ST AT NIAGARA COLLEGE, GLENDALE CAMPUS, 135 TAYLOR ROAD, RR#4, NIAGARA-ON-THE-LAKE. ON SATURDAY; 9;00A.M. TO 5:00 P.M. SUNDAY 10:00 A.M. TO 5:00 P.M.
APRIL 15TH WILL BE JACK KENT OF THE POTTING SHED AS OUR SPEAKER AT 7:00 P.M. AT GRACE UNITED CHURCH. DON’T MISS THIS! DUNNVILLE LION’S CLUB HOME AND GARDEN SHOW; APRIL 23rd, 9:00—9:00 AND 24th, 9:00—5:00, ADMISSION FREE. AT DUNNVILLE ARENA. LOOK FOR OUR DISPLAY. APRIL 17TH IS ALSO THE FAMOUS MENDELSSOHN CHOIR AT DUNNVILLE HIGH SCHOOL.TICKETS AVAILABLE AT CHAMBER OF COMMERCE. APRIL 24TH IS OUR SPRING FORUM IN FORT ERIE. ADMISSION FEE OF $5.00 REGISTRATION TIME 9:00A.M. CLOSING AT 4:00 P.M. SPEAKER KARIN VERMEER OF VERMEER GREEN HOUSES. PLEASE BRING A BAG LUNCH, COFFEE AND GOODIES SUPPLIED. APRIL 23RD & 24TH FROM 10:00 A.M. TO 8:00 P.M. AND APRIL 25TH FROM 10:00 A.M. TO 6:00 P.M WILL BE THE ROYAL BOTANICAL GARDEN SHOW, PLAINS ROAD WEST, BURLINGTON. MAGNOLIA SOCIETY WILL BE HOLDING ITS ANNUAL GENERAL MEETING AND TOUR IN NIAGARA FALLS ON APRIL 3OTH TO MAY 2ND. Meeting was opened by President Judy Jeffery welcoming all new members. Acting Secretary Pamela Blanchard for Doris Thomson gave all members handouts of the past minutes of the April 15th 2010 meeting on request of the President. Thank you to Pamela for acting secretary in Doris Thomson’s absence while on vacation. Treasurer Report given by Teresa Borodyn. Accepted by Judy Jeffery, Seconded by Ian Steel. A Master Gardener Workshop at the Botanical Gardens is to be held on July 18th, the topic being pruning new trees. Additional information on request. The cost is $250 per person. The Niagara Parks School of Horticulture. The Niagara Falls 16th annual Garden Walk will be on July 24th, cost of $10. Further information at (905) 374-2104. Thank you to Kim Christoff and all volunteers involved in making the Home & Garden Show a huge success. It was great exposure to the general public, saying ‘We Are Here… in your community’. At the show we signed up 25 new members and made sales of 2 t-shirts and 6 aprons. President Judy Jeffery encouraged all members to pot-up and give donations of plants. Tables being on loan from Grandview Lodge, possibly 6. Tarps for the lawn to set large items on. Karen Waltham is offering to bring tables down from the Church. Pamela Blanchard is to post flyers one week prior to the event. Two floats of cash are needed to keep Plant Sale and Garage Sale funds separate. New memberships will also be kept separate. The raffle draw will take place at 12 noon on Saturday, May 22nd, 2010 . Karen and Betty will be in charge of the Garage Sale. Ian will be on cash for the Plant Sale, Don will be on cash for the Garage Sale items. Teresa asked that we provide vegetables at the Plant Sale, saying that in past years the public was looking for vegetable plants. Volunteers are needed to help on the day of the Plant Sale. Set-up is to start at 6:30 am , and take-down to be at 1:00pm . The Executive Committee voted that a donation of $1000 be made towards the Mudcat Festival to aid with the costs of decorations and bands. All committee members present voted in favour of the donation. The Executive Committee voted that a donation of $1000 be made to Grandview Lodge Nursing Home to help with the costs of the Century gardens. The Grand Opening of the gardens is to be June 28th, 2010 . Giveaway of 15 awards to best viewed gardens curb-side. Ballot boxes and leaflets will be placed about town in 5 locations by mid June. Received, a $1000 donation by Scotia Bank. Thank you very much Pat Taylor Van Natter. Guest Speaker – Monica Dempster. Her topic was the care of tropical plants. The three main things to remember are water, bright light and fertilizer. We can kill our plants with TLC. Too much water and not enough air will damage roots. Feed once every two weeks with 20-20-20 or Miracle Grow fertilizer. The battle against pests was discussed, and plant sales took place. There was a brief intermission where refreshments were served. Thank you Janice, Maura, Aditza and Betty for the wonderful lunch. Betty Ballanger made draws for many plants and items. Thank you Betty. Karen Waltham submitted info from Vermeer’s ‘From Our Greenhouse to Your Garden’ e-newsletter of May 2010. Vermeer’s Garden Centre & Flower Shop can be reached by e-mail at vermeers@vermeers.ca or at their Website http://www.vermeers.ca . The Shaw Garden Tour will be held on June 12th, 2010 from 10:00 am to 4:00 pm. Tickets may be purchased on the day of the event outside the Valu-Mart located at 166 Queen Street , Niagara On The Lake. Ian Steel and Betty Ballanger will be carrying the banner. Pamela Blanchard is to be at the parade site # 72 by 8:00 am on Saturday, June 12th with the banner that she has constructed. Approximately 20 walkers have volunteered to be there. See also Mary Lou with her three-wheeled cycle, Don with his macaw ‘Luna’, and Judy with her scooter. Rose Bush Draw winners are: Mary Lou Johnston, Jan & Regina Loots, Betty & John Ballanger, Mary Ann Phelps, Bob Croft, Chris & Bob Laramine, Kim Christoff, Mary Van Oosten, Gwen Van Natter, and Don Davis. Rose Bush tip: Ensure when planting to put the graft of the stem under the ground by about 1 inch. They need food. Place epsom salts over the ground around the plant, and chopped banana peels around the bush. Feed your rose bushes well and they won’t get disease or rot. Enjoy the beauty these bushes will bring you. President Judy Jeffery adjourned the meeting at 9:04 pm.